I’m happy to announce UnimasThesis, a LaTeX class for authoring Universiti Malaysia Sarawak theses. The umalayathesis document class (for Universiti Malaya theses) has been updated — you can now include a Malay abstract in addition to the English abstract. Download here, or get it from bitbucket. LaTex & Thesis: FOUR good reasons. chances of my computer getting crashed is directly proportional to the importance of the document, for example – the chances of my computer getting crashed when I’m writing my report for the final year project is HIGHER compared to when I’m a writing a letter to ask permission for motorcycle sticker. chances of my computer getting crashed is inversely proportional to the time left for my deadline, for example – the chances of my computer getting crashed when I’m writing my report for the final year project when the deadline is tomorrow is HIGHER than the deadline 1 week ago. Well this theory is not proven, this is my ‘syok sendiri teori’. I noticed one thing in common in the patterns above is the size of the documents. My computer actually crashed (this is in 2002, currently in 2014 – it does not crash but it will run in slow motion :)) because it cannot handle the size of my file getting into. A computer crash commonly occurs when a hardware exception occurs that cannot be handled. This waste my effort and time. FOUR good reason I found to start using LaTex for my thesis. ONE. Scalability – As I mentioned earlier – the size of your document. Word (or even Open Office) can get slower when editing large documents with equations and figures. In LaTex, I break my thesis into smaller chunks (like one chapter per file) and then let LaTex combine them altogether. This also lead to more organizable and manageable documents. An interesting graph from Marko Pinteric showing the relation between document size and effort / time required. TWO. Support – Excellent support from the web community, one such example is the Malaysian LaTex User Group blog. I can ‘google’ any matter related to LaTex and come up with a solution. Also local university thesis template is available in LaTex, thanks to good people that created and shared it for free. 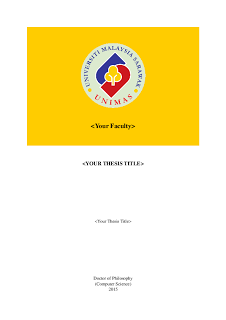 You can get it from here Malaysian University Thesis LaTex Template. THREE. Interoperability – LaTex is OS independent. An actual LaTex file is merely a text file, which is just about the most portable format in computing. So I found no problem writing my Chapter 1 in a Fedora system and then shared it with my supervisor in a Windows system. FOUR. Quality – This is my personal belief and maybe few others, I feel that documents produced using LaTex looks better and more professional compared to Word, especially if it involved mathematical equations and algorithms. I will let you to try and decide upon by yourself. You don’t have time to learn it. – You’ re reaching a deadline, you better stick with what you know first. Your document is already written – You had written your thesis in Word and need to submit in two days. Well my friend, I found no good reason to convert to LaTex and submit it. Excellent write-up from external links. Just google ‘advantage and disadvantage of LaTex’, you can find so many sources available out there. As a conclusion, there is no winner whether its LaTex or Word (or other type of WYSIWYG editor). If you need to write a short letter, you are best writing in Word. For simple documents, you can save time by writing in Word or Open Office. If you are writing a long document like a Master or PhD thesis, I think it is better with LaTex. It will be slower at the beginning (the extra time required to learn LaTex), but at the end it will save a lot of your time and effort.